PSR Series pumps are the ideal solution for ambient temperature, ultra-pure recirculation applications. These Teflon® PTFE and PFA pumps are completely metal free and operate with a unique shuttle valve that eliminates the need for complicated detents and manual resets. They perform safely and reliably running continuously throughout their one-year warranty. They offer air supply pressures up to 4 Bar (60 psi) and operate in thermal cycling applications with fluid temperatures up to 100°C (212°F). The pumps are available in PSR025 and PSR050, which are capable of maximum flow rates of 25 and 50 lpm, respectively. 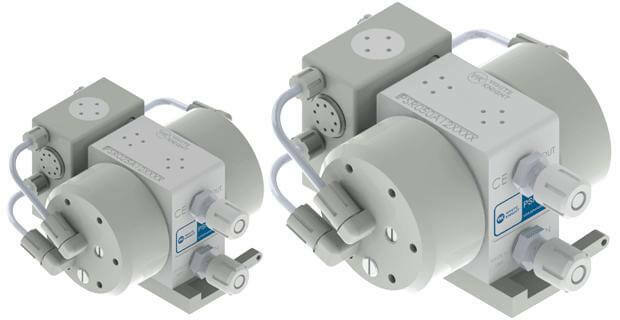 PSR Series pumps feature White Knight’s Pneumatic Logic™, a detent-free shuttle valve design that improves performance and reliability by minimizing vibration, pulsation and wear. **dB Level at 60 psi 50 CPM (top) and 60 psi maximum CPM (bottom). Sound Levels measured in accordance with ISO9614-2:1997.